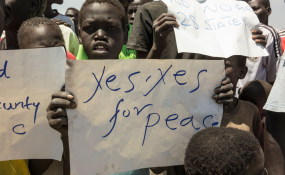 Children call for peace in South Sudan. South Sudanese soldiers are responsible for most of the killings and rapes of children carried out in the country, the United Nations said on Monday. "I am especially alarmed by the rampant levels of grave violations committed by government security forces," Ms Virginia Gamba, the UN Special Representative for Children and Armed Conflict, told the Security Council. The Sudan People's Liberation Army (SPLA) is said to have carried out nearly 80 percent of the 987 killings or maiming of children documented by the UN between October 2014 and June 2018. The SPLA was also responsible for more than 90 percent of 658 verified incidents of sexual violence against children during that period, the report adds. Most of these cases involved "gruesome gang rapes," the UN envoy said. "The full scale of sexual violence affecting children is believed to be under-reported, in particular against boys, owing to fear of stigmatisation and reprisals and to the lack of adequate support services and avenues for accountability," Ms Gamba noted in the report. The UN cites a rampage by government soldiers and "armed youth" in Unity State six months ago in which "sexual violence was used extensively during indiscriminate attacks on villages." Two years earlier, SPLA troops raped or gang-raped 34 girls and 30 women from villages in Koch County in Unity State, the report says. "Sexual violence was used as a form of collective punishment to instil fear and humiliation within communities," the UN observes. In August 2016, 10 girls fleeing to a UN civilian-protection site in Bentiu in Unity State "were stopped on the way there by some 20 SPLA soldiers and taken into the bush and raped repeatedly," the report adds. Most of the attacks on schools and hospitals documented in the period covered by the report were also said to be the work of the SPLA. Factions of the armed opposition recruited and used a sizable number of child soldiers, the report says. The UN counted 1,447 children, including five girls, among forces loyal to rebel leader and former vice president Riek Machar. Groups associated with Taban Deng Gai, formerly a prominent figure in the armed opposition and now one of the country's vice presidents, recruited and fielded 801 children, including 46 girls, says the report. The SPLA accounted for more than 40 percent of the total number of 5,723 child soldiers reported to be in the ranks of armed groups. "Children were used to commit atrocities against civilians, including other children," the report notes. The UN said poverty was a key reason why children became members of the South Sudan government army. "Several children stated in interviews that they had joined SPLA owing to poverty, since they were paid between 700 and 1,500 South Sudanese pounds per month (between $5 and $12) by SPLA," the report recounts. Earlier this year, army leaders agreed to allow UN units to visit all military barracks to screen and release child soldiers. But only one such mission had taken place as of June, the report notes.